Her gayety seemed like jewels on a skull. : "Girls," Season 5, Episode 6: "The Panic in Central Park" - There's nothing aggressive about that, it's a ballad. Before mercury, my blood used to fill thermometers. "Girls," Season 5, Episode 6: "The Panic in Central Park" - There's nothing aggressive about that, it's a ballad. I completely agree with Joshua Alston at the AV Club on what this episode achieves: "Marnie’s not ready for a destination, she’s ready for a journey." "The Panic in Central Park" is a self-contained romantic comedy in which the endgame is not finding someone a girl can be happy with, but finding that she needs to not be with anyone or the dream of being happy with someone is going to die. Girls, Episode Forty-Eight, "The Panic in Central Park"
Marnie and Desi are mid-fight over how Marnie doesn't want a confrontation and Desi does. They sit, boxed into the bedroom Desi started to construct to allow Marnie more space, which divides up their studio into even smaller slivers. She accuses him of aggressively playing guitar at her, but he says a ballad can't be aggressive. The Aggression of Ballads ought to be the title of Marnie's solo album. Her fear of abandonment and ambivalence about being needed has driven her to be with guys who either demand everything, no matter how unreasonable or unpredictable the content of that commitment, from her (Charlie and Desi) because she is not quite solid on what a commitment should look like and feel like, or reflect the way she perceives herself as a person entitled to culture and success (Booth Jonathan) or lust and adulation (Ray at his weakest, although his respect for Marnie as a musician and his sustained support for her that dates all the way back to the second season bodes well for him as being the right choice — as an ally if not as a partner, since everyone else needs to get out and stay out of her life). Desi's touch propels Marnie out of bed. In Marnie's first scene with dialogue with Hannah in the pilot, she described the thing that confirmed to her that her relationship with Charlie was wrong: "His touch feels like a weird uncle's now." There is no turning back now that she's repulsed by Desi's touch. She's at the point where she can't lie to herself. The threat of suicide does nothing to keep Marnie from leaving. Desi is like Charlie with Adam's intensity, another instance of Girls' characters taking a cue from Hannah, a character whose every motivation is interrogated and dismissed but whose tactics and choices are (unconsciously) adopted when crises arise. When Marnie hit bottom after Charlie left her, she tried to recoup the loss by becoming an artist and having the "great artistic love story" Hannah alleged she was having with Adam. I hadn't remembered until watching this episode that Charlie was also a musician, but speaking of Charlie, there he is, on the street, among a clutch of dudes catcalling Marnie as she takes a walk to get away from Desi. In their mutual bewilderment, Marnie's impulse is to run, but Charlie pursues her. When Marnie brings Charlie up to date on her marriage and the state of her life, she mentions music because that's something they share, but I'm curious as to whether or not she felt like they shared that when they were together. The spectre of Marnie's musical theatre days comes up in the scene, with one of Charlie's fellow dudes coming onto Marnie with a mixed-up West Side Story reference, but I wonder how much her involvement with Charlie was a sublimation of her musical aspirations. It would make sense if part of her refusal to end their relationship him was informed by the fear that, once it was over, she would have to face that she wants to be a musician (a reality she doesn't have to face much with Desi, since even as a partner in their performance she keeps positioning herself as a muse). Another thing she brings up is the fact that her dad didn't come to her wedding. Charlie reveals that he left her after finding out that his dad hung himself. It's after he divulges this that Marnie consents to catch up with him, sharing with Charlie that he was her family and all the songs she writes are about him. Charlie was very straightforward with Marnie in season one that his father's abandonment of him made their breakup difficult to cope with and that his decision to be with her was more important for him to honor than whether or not he was necessarily happy with her. Marnie, similarly, is not inclined to want anything to do with what makes a relationship, just that one exists and she is in it: when she and Charlie got back together at the end of season two, she was eager to declare how they were through with their roaming and striving and had arrived at being an established, old married couple who were going to be status quo for the rest of their days on earth. But despite how similarly damaged they are, Marnie can't fake being happy when somebody touches her and she doesn't want it. Despite her reminder of that feeling, she allows herself to feel the glow of Charlie's affection. It's been a few years — "The Panic in Central Park" is required Girls viewing for a few reasons, but chief among them is how Marnie and Charlie articulate the passage of time on the show. There are very few time jumps but a lot has happened within the space of the three-ish years the show has covered (Charlie reveals that his app, Forbid, in addition to being shuttered, was one of several companies he was involved in since his last appearance on the show). Charlie's attention may not be fresh, but Marnie is in just the mood to dissociate from their baggage while simultaneously using it as a way to dismiss the consequences of their time together. Nothing can happen because it can't, even if it does. He's hurt her severely enough that Marnie thinks she's immune to the effects of his attention. Marnie is never immune to the effects of romantic or sexual attention from men. So she follows Charlie even though he acts, talks, and looks different from when she knew him. He blames this on her, insisting that she doesn't remember him right. When he takes her to a store, heaps a pile of "Bob Mackey Barbie doll" dresses upon her, and quickly vanishes into the burrito place next door under the guise of needing a bathroom only to come whirling back to get her, tossing a bunch of cash at the cashier, and tugging Marnie away in a hurry informed not at all by romantic spontaneity but the evasion and panic of criminal behavior. Marnie's not not into it, and I love how much Marnie's naivete is part of this story. It is not that she is willing to overlook so much in order to be with someone, but that when she looks, she only sees what she wants, and this episode demonstrates how potentially dangerous that is for her and how she recognizes this in herself and refuses Desi's insistence that she needs him to protect her because she's so naive, because, as Desi repeats several times at the end of the episode, Marnie is going to get murdered acting the way she acts. And "The Panic in Central Park" shows Marnie getting mugged before settling in for an evening at Charlie's squalid apartment. She ignores every red flag — Charlie's apartment used to be so orderly and aesthetically pleasing in the aspirational, corporate way Marnie favors, now she's inclined to give him tips about what kind of curtains he uses to cover the windows before retracting her critique, she is so unable to trust herself and all she knows is she can't stop trying to change people, she doesn't realize what she's commenting upon — until she finds a needle and walks home barefoot. The conclusion Marnie comes to at the end of the episode (with the help of a girl she meets in Charlie's shared bathroom whose girlfriend had abandoned her on the freeway) is that she needs to protect herself, she needs to listen to the impulse to recoil from someone's touch immediately. Nobody needs to teach her that lesson, she has earned it and she needs to respect that. On her way to that conclusion, Charlie takes her to a fancy party that recalls the time Marnie spent working as a hostess at a club, the "pretty person job" she seized when both Charlie and her gallery job deserted her. Charlie's client, who he's there to sell cocaine to — the last time cocaine affected Marnie's life, it was when Hannah did it and crashed her night with Booth Jonathan to tell Marnie that she was a bad friend — propositions Marnie, who he assumes is a prostitute and another product that Charlie is selling. Marnie revels in it, charging several hundred dollars for an appointment she has no plans to keep, and takes Charlie out to a lavish dinner with it. They dance, they sway through the park together, they kiss on somebody's boat — Marnie is weary enough by this point on their date that she asks several times whose boat it is and if they ought to be using it — and topple it over. Under the water, Marnie takes a second to consider what she's doing with Desi and how her experience with Charlie informs it. She probably feels like she's still paralyzed with fear, up against the pole, unable to join the party, just like she was when Charlie met her. When Marnie leaves Desi, the episode leaves her climbing into bed with Fran and Hannah, where Hannah acknowledges her and falls back asleep. With the end of Girls upon them, this was where I was hoping to see them. I'm a writer, editor, and award-winning journalist dwelling on the banks of the mighty Susquehanna. Lend yourself to other books. Love me and buy me. Say You Love Me - oh, Say it with Paving Stones! Sheila Heti's How Should a Person Be? On "The Rite of Spring"
Fiction: "I'm Forever Blowing Bubbles"
Fiction: "May Two People Breathe in a Real Room"
Fiction: "Death of a Child Model"
Fiction: "Van's Friend in the City"
I write about HBO's Girls, episode by episode. Words get twisted. Syntax bursts. Pronouns disappear. Except the one that melts me into the world. 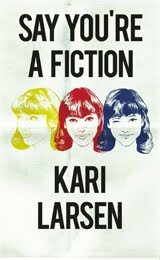 All text unless otherwise specified copyright © Kari Larsen 2010-2015. Simple theme. Powered by Blogger.